Winter seems to be dragging along. It’s early May, but feels and looks like March. The antidote to the gloom appears to be the bright yellow of the massed planting of the Forsythia shrubs. 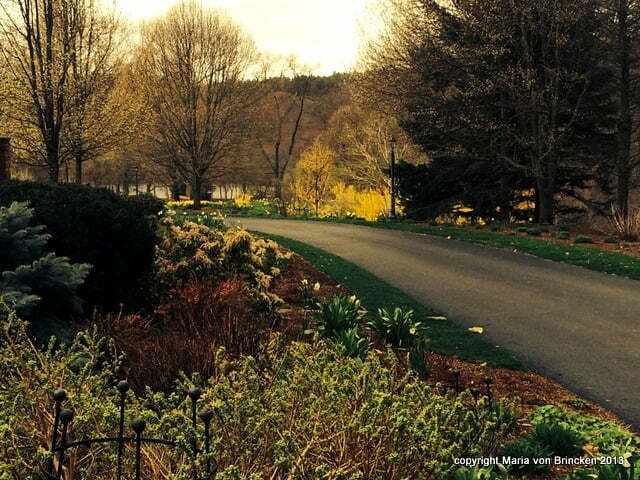 It adds a glow to these driveway gardens that I designed when one psychologically needs it most – in the drab days of early spring. 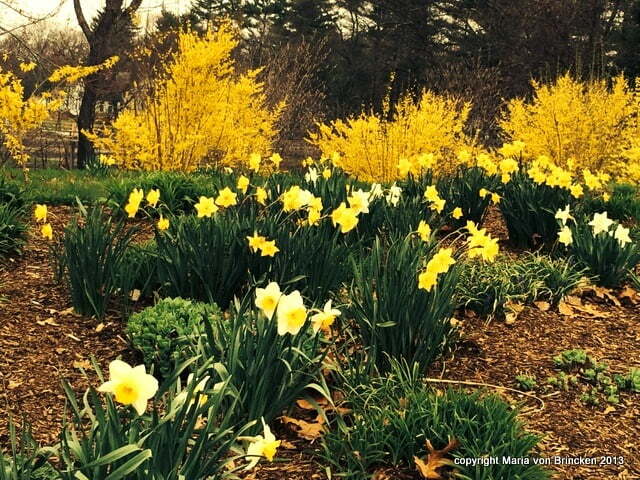 The daffodils in yellow and white scattered in planting groups throughout the gardens connect and pull the cheerful color throughout the landscape. I’m amazed each year by the power of yellow to cheer up a drab grey day. It’s a powerful signal that spring is really here. The chords of yellow spring into the song of hope that the dreary cold and gray weather, bare ground and branches will be replaced with new leaves and flowers and bright sunny days. I absolutely agree, Maria. I just spent a week in coldish, greyish Lower Hutt, New Zealand and at the gate to the place I stayed at, there was a great clump of YELLOW red hot pokers. Different to the orange variety we have, they seemed to glow in the watery sunshine and were very warming and welcoming.